Can you believe it? My book, Arthur Zarr’s Amazing Art Car, has taken me on the road to speak to children at schools around the country! To date, I’ve spoken at some 38 schools in my hometown of Houston; in Shreveport & Monroe, Louisiana; in Atlanta, Georgia; and in Austin, Texas. 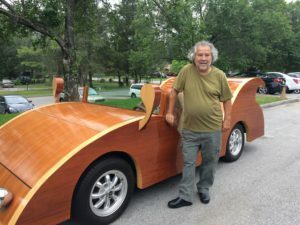 Bill Megenhardt says this is the kind of art car a ram would probably drive! 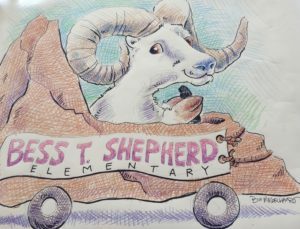 Most recently, I was invited to travel to Chattanooga, Tennessee, and I spent a beautiful morning speaking to students at Bess T. Shepherd Elementary School. 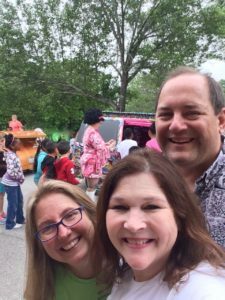 Three art car drivers joined us at my school visit: Isaac Cohen (Houston), Wendy Tippens (Tennessee), and Paulette Perlman (Florida). And the presentation wouldn’t have been complete without the talent of my amazing illustrator, Bill Megenhardt. Together, I think all of us delivered a visit that the students will remember for a long time. And that’s not all—several other art car drivers visited a few more schools around town: Jewelz Cody, Bonnie Blue, Ted Mangum, and a few others (I’ll try to find out their names to add them later!). We were IN THE NEWS throughout the Chattanooga weekend, starting with an article published in The Chattanoogan— Read the article here! What’s more, News 12 (WDEF-TV, David Moore) was on hand to film the school event, and the children were excited to meet a real author, a real illustrator, and to view the art cars up close and personal. Click the words “ART CARAVAN” below to see the televised feature! Kate Warren (Art 120), Cathey Nickell, and Lee Warren. I also had the pleasure of meeting the dynamic Kate Warren, executive director of Art 120, a seven-year-old non-profit organization created to enrich Chattanooga and its surrounding community through the creation, education, and celebration of STE(A)M-based learning. Kate explains, “About 32 of our 42 elementary schools in Chattanooga do not even have art programs, so our organization raises funds to bring art to the schools.” Read more on what ART 120 is doing by clicking this link! Isaac Cohen brought the beautiful wooden “Slider” from Houston for the weekend festivities. The cherry on top of my stay in Chattanooga was a book signing at Barnes and Noble (thank you, Kelly Flemings). It was a great weekend full of fantastic art cars, hometown charm, delicious food, interesting sites, and a whole bunch of new friends. I enjoyed my visit so much, and I hope you’ll read more about the creative, important work of Art 120 through the links I’ve posted here. Be like these guys—be amazing! 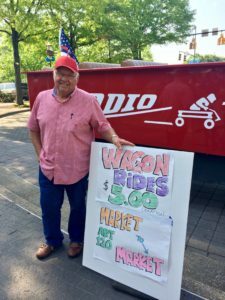 Ted Mangum’s “Radio Flyer” was one of the art car hits of the weekend!